A full year ahead! Our first–and only–year with all four children in school. Statistics, English, and Physics at the local Community College – From my Charlotte-Mason-y viewpoint at the beginning of high school, I never thought we’d go the route of community college. It is not free for homeschooled high-schoolers like it is in some areas, and I had heard the classes were dumbed-down as well as. . . you know . . . institutional and secular. (Faugh!) But as one wise CM mom said, if children are “born persons” (a Charlotte Mason quote), then all options should be on the table. As we trekked though high school, it became apparent that our firstborn son learned better and worked harder for outside instructors. And from what I’ve heard, this is not uncommon for teen boys. One of my philosophies is that it is better to learn less information and learn it well, than more information poorly. I’d rather our senior did well in a class at community college, than slog and groan through a fabulous custom-made course at home. Add to that the need of a 4yr degree for his career goals, and the dual-credit option just began to make sense. Dusty is not the easily-influenced, follower type, so I felt he would probably do fine in the CC setting. Statistics had been recommended to us from several sources (Novare is one) as a better, more practical option than the typical 12th-grade calculus. Physics is important for his aviation and will include some respectable labs that are hard to duplicate at home. And English was just a way to check off the language arts box for the year and also for his first year of college. These courses aren’t cheap (so be sure to budget for them in advance) but they really aren’t more than quality online classes at this point. Liberty Classroom – I’ve had my eye on Tom Woods’ history courses for awhile as we are Libertarian/free-market/sound-money people. This site offers a variety of economics/social-study lecture-based courses for a flat fee. I will let Dusty select which courses he would like to take. Dave Ramsey Foundations in Personal Finance – After weighing this against the Life of Fred finance course we chose this one because of the video component which will make it more engaging. The Man plans on going through this with Dusty which I think will be a big win! 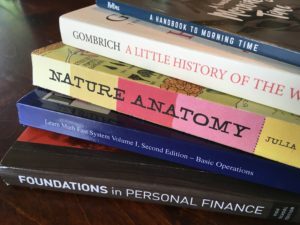 I have become convinced of the importance of a personal finance course in the senior year so the information is fresh on the mind when the student launches out. Extracurriculars will be piano, choir, handbells, ballroom dance, and Civil Air Patrol again. His job at the lawn care business has worked out really well and given him experience in construction, landscaping, truck driving/trailering, and business interactions, as well as the mowing. We are grateful for it every day. He has also started taking flight lessons this past year, and is getting close to receiving his pilot’s license. He is truly growing up at warp speed! Systematic Mathematics 6 – I learned about “Systemath” while doing math research due to Dusty’s and my experience of drowning in Singapore Math, which we were using at the time. Singapore seemed so great when we started, but felt overwhelming by the time we got to sixth grade. I stumbled on the Systemath website, read about their philosophy, and was instantly sold. The change in both Dusty’s attitude and math comprehension after switching to this was such a relief and joy! (To me at least. I’m not sure Dusty would have gone so far as to call it joy.) Now after that sales pitch I must inform you that the program is technically out of print as the creator has passed and his daughter’s family (who took the business on) got too busy to continue it. However the website is still up and you may be able to contact them and ask for mercy. 🙂 This program consists of a daily video lesson and a printed worksheet from a CD. CM Skills, Writing Trails – Duncan is getting to that middle-school-level where I’m beginning to look at formal composition instruction. We will begin the year with the CM writing (Writing Trails is part of this- narrations) but I will be thinking about adding Write With the Best either this year or next. Ellen McHenry science, as well as living books – My previous student really enjoyed and learned from the McHenry courses he did, so my plan for middle school is to skip traditional curriculum and just do McHenry and a lot of living books. A Child’s First Book of American History/A Little History of the World – The narrative U.S. and world histories for this year. Piano, Choir, and Handbells. He is less enthusiastic about art than he used to be, so that may be more hit-and-miss this year. I will focus more on other hands-on skills such as “shop.” He was very excited to complete Hunter’s Safety this summer. Learn Math Fast, book 1 – I am continuing my experiment with this new-to-me curriculum. Duncan used it briefly last year and will be moving on to Systemath. Pearl is in a good place to start out with the first book. I still have my trusty Strayer-Upton to fall back on if it goes poorly. CM Skills – Pearl will be doing plenty of copywork and dictation this year. Complete Book of United States History – Our first history survey. I start out with U.S. history but will add in world history beginning next year. Magic Schoolbus Books – I recently discovered Pearl has been devouring these books this summer so I may need to find some other science books to add to the list! Choir, Recorder, and Irish Dance will be her extras. I have some resources on hand for art, but am unsure which I will actually use this year. She did well in her first swimming lessons this summer. I haven’t written much about “Jack,” our youngest! But he is now old enough for Kindergarten, and I would love to share sometime about my philosophy of early childhood education. I will be using the same program for him that I used with Duncan and Pearl. The Wee Folk Art Homeschool guides are a lovely season-based schedule of books and easy projects. I do not do writing or math at this stage, so I skip those parts and we just have fun learning together. Duncan and Pearl were not ready for reading in K, but Jack is showing interest so I may try some phonics with him and see how it goes. We use The Reading Lesson for this.